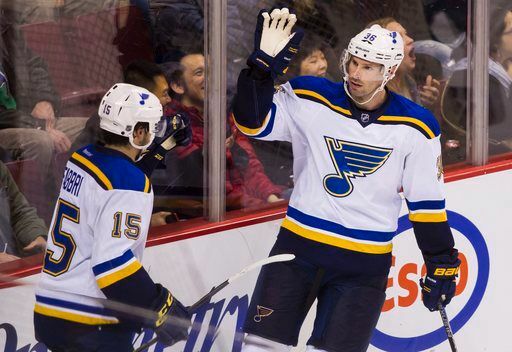 Following a rough stretch resulting in a pair of losses in which the Blues let up 13 goals, they came out with a 3-0 victory against the Vancouver Canucks. Brian Elliott stood tall in net with the shutout, but he only had to stop 19 shots much to the credit of the Blues defense and offense, which accounted for a season-high 50 shots. This game marked Elliott’s first after missing 10 games due to a lower-body injury. Following the win, the Blues keep pace and sit two points behind the Dallas Stars in the division with a record of 42-22-9 for 93 points. In third, the Blackhawks trail St. Louis by three points with a game at hand. Although it was a scoreless first period, the Blues came out firing outshooting the Canucks 18-6. Midway through the period, the Blues got perhaps their best chance of the period as Ryan Miller turned aside a one timer by Vladamir Tarasenko in the slot with his glove. Although shots were hard to come by for Vancouver, Elliott responded for the Blues when called upon. Early in the second, Elliott robbed Dan Hamuis in all alone and later robbed Daniel Sedin sitting on the door step showing his health was of no concern. That helped set up an opportunity for the Blues late in the period to get on the board. On the power play, the Blues picked up the tempo on the break out. In the offensive zone, Paul Stastny delayed, allowing a defender to whiff by, before sending a pass in stride to Robby Fabbri. Fabbri slid a pass across to Troy Brouwer heading far post as Brouwer put it in the empty net past the diving Miller for the goal. The tally marked Brouwer’s 15th of the season and put the Blues up 1-0 with 3:32 left in the second period. The Blues thought they had another as the clock was winding down. Brouwer turned and fired through Miller, but after further review, the puck crossed the goal line after the buzzer sounded keeping the game 1-0. In the third, Tarasenko finally struck through after numerous chances throughout the game. With just over 11 minutes left in regulation, Jori Lehtera entered the attacking end and passed to Jaden Schwartz on his left. Schwartz fired a shot as Miller blocked it leaving a juicy rebound in front. Tarasenko put it home for his 34th of the season giving St. Louis a 2-0 lead. Late in the period, Schwartz got one of his own on an empty net to seal the win. Next up for the Blues will be a test on the road against the rising San Jose Sharks. The game is set for Tuesday, March 22 at 9:30.